I've known about Bistro LQ since it opened, and after hearing buzz about Bistro LQ I was eager to give the restaurant a try but never could seem to find the right time or people to go with. Bistro LQ is the new home of Chef Laurent Quenioux, formerly of Bistro K and interestingly the director of food and beverages at Dodger Stadium. 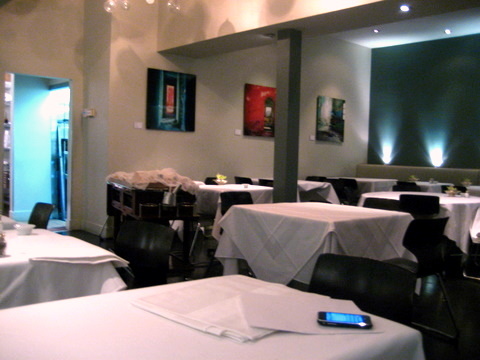 The restaurant has a cozy feel, though perhaps a bit more contemporary than your typical bistro as evidenced by the photography on the back wall. 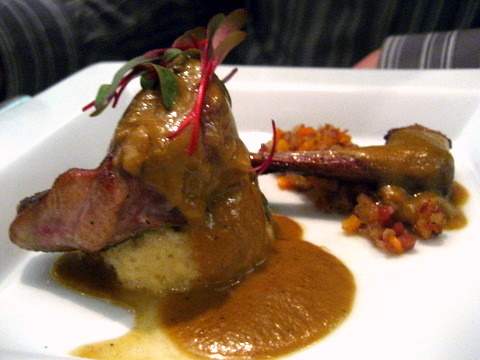 LQ offers 6 and 9 course tastings as well as an eclectic a la carté menu. 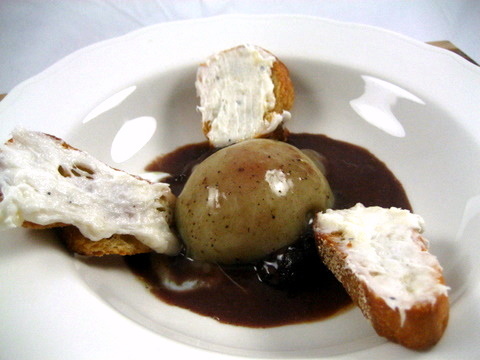 Though my typical MO is to go with the tasting, but with the option of ordering half portions of many of the courses allowing diners to build their own tastings, a la carté is the way to go at LQ. My companion chose to go with the set six course tasting, and I picked seven courses from the menu to keep the pacing even, though truth be told, I would have liked a few more courses. 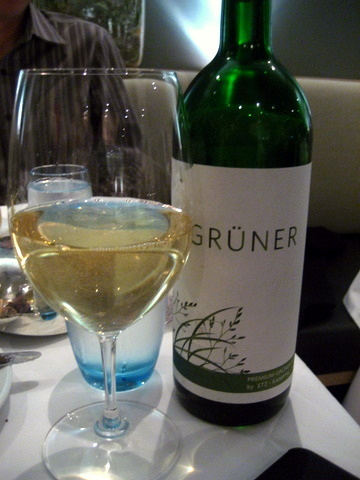 I started the meal with a Gruner hoping that the acidity would compliment the early seafood courses. The wine came tinged with the scent of green apple but lacked the sharp crispness I was expecting. A very enjoyable start to the meal, the gratin complimented the natural flavor of the fish, but was so mild I didn't even know it was oyster until I asked our waiter. We were told to start with the warm preparation. Both my companion and I got the impression of a breakfast course from the french toast and syrup while the foie was more of an afterthought, adding a tinge of savoriness. 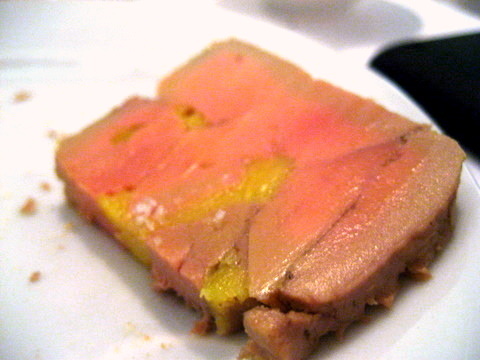 We followed with the terrine which boasted a noticeably richer flavor and rustic texture. 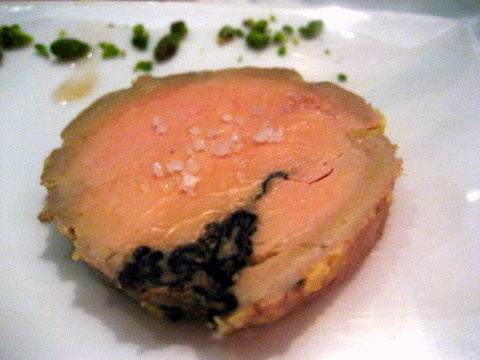 The torchon proved to be my favorite, with a buttery smooth consistency and a subtle accent of truffle to compliment the unctuous liver. I am typically a huge fan of Kumamotos but I found these examples to be overly minerally. 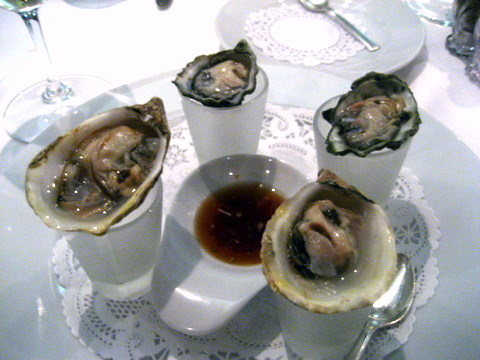 The Kushii oysters by comparison were meatier and milder in flavor making for a lissome mouth feel and clean finish. The best course of the night, I really wish I went with my instinct and got a full order of this. 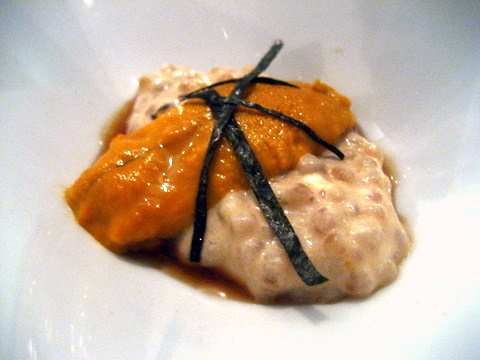 The beautifully fresh uni, was superb on its own but the tangy spice of the yuzu kocho brought the dish to another level. 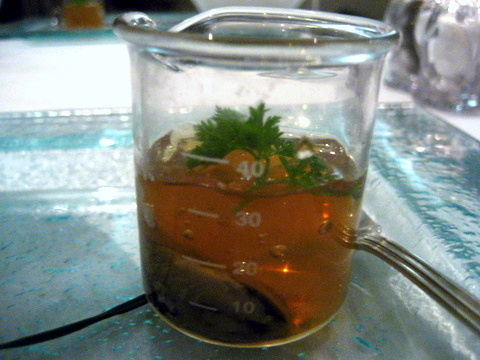 The uni came with an oyster shooter which served as an effective palate cleanser though personally it boggles my mind why anyone would want a palate cleanser, since all it does is cut short the beautiful flavor of the uni. We didn't actually order this wine, the restaurant was out of Burgundy we chose so our waitress selected this as a replacement. 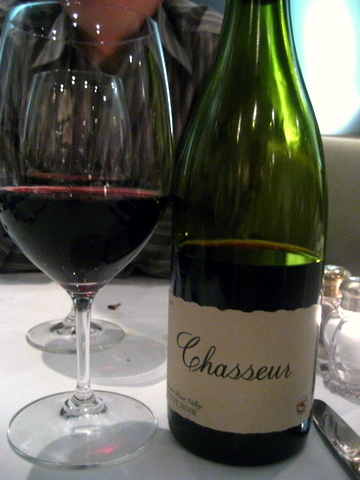 The Chasseur had all the elements of a classic pinot with fragrant aromas of strawberry and bright cherry, with secondary dimensions of earth and spice. A good substitute for the Burgundy, but I just would have liked to been have given a choice. 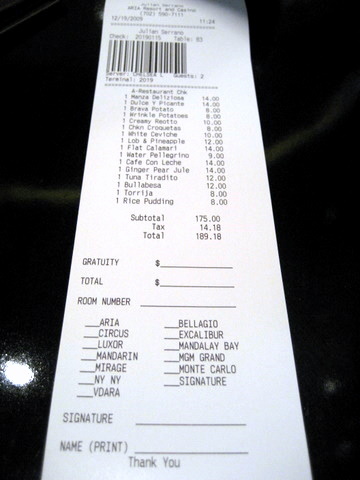 At this point the dining room filled up, and service consequently took a nosedive. 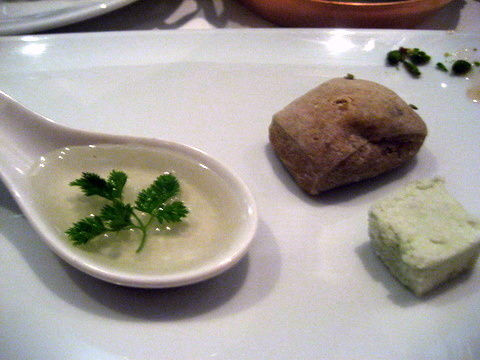 The next two courses took just over an hour which really disrupted the flow of the meal. 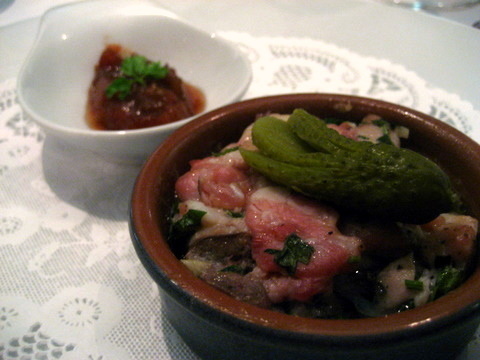 This is the first time I have had rabbit served as a terrine, the dense meat was an interesting change from the typical tenderness of rabbit meat. The garlic and fresh herbs added a straightforward but effective compliment to the sapor of the rabbit while the chutney provided a blunt sweetness. 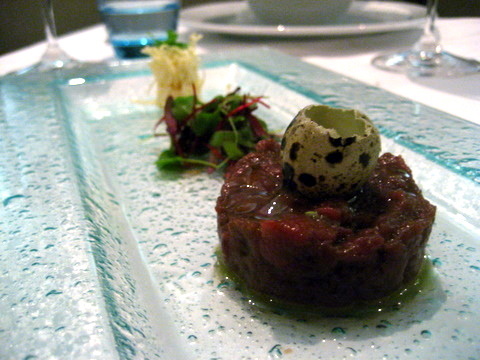 An incredibly distinctive tartare, the earthy iron tang of the venison was immediately apparent. 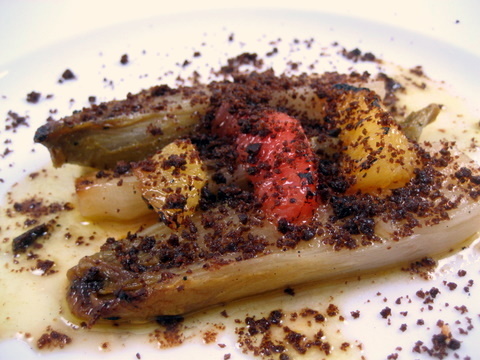 The distinctive weightiness of the deer was punctuated by the bitter greens and vegetal celery root. While the vegetables added some crispness to the soft gamy meat, a more complex flavor profile would have made this course. One of the most intensely flavored and complex bites I have had in recent memory. 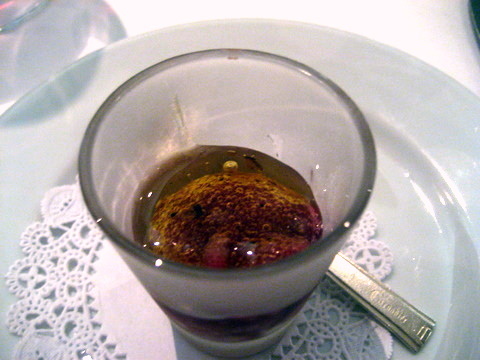 Even before tasting the first spoonful, the aroma of truffle is dizzying. The flavor opens with herbal sweetness accented by the complex flavor of the truffle and completed with a chilling berry tartness on the finish. 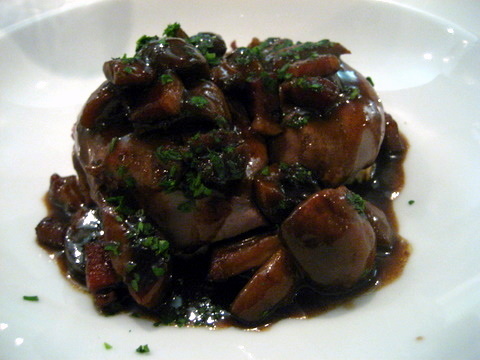 Mr. Fierson Eggs - Poached Hen’s Eggs, in Red Wine, Bacon, Mushrooms, "Meurette Style"
After having a superb Oeufs en Meurette at LudoBites I was eager to try LQ's version. The Meurette sauce was spot on, with a deep savoriness enriched with the richness of the bacon and earthiness of the mushrooms. The eggs themselves felt more soft boiled, lacking the supple grace and runny yolk so critical in a poached egg. 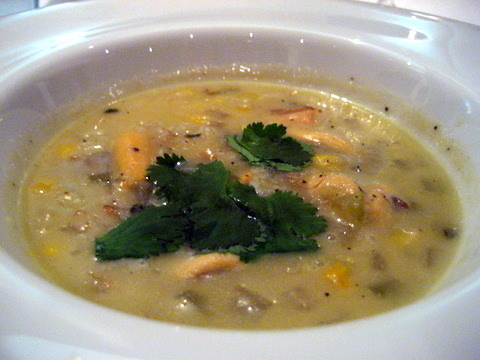 This is the first time I have tasted a combination of risotto and chowder, but I thought the grain did an admirable job adding substance to the soup while the sweet corn was a natural foil for the flavor of the shellfish. The mussels themselves were unnecessary, as the chowder was already infused with their delicate brine, rather their mealy texture and slight funk detracted from the overall enjoyment of the dish. Pigeon - Shallot Flan, Duck Gizzard, Pumpkin and Serrano Ham Mirepoix, Pumpkin "jus"
One of the preparations of pigeon in recent memory where the accouterments actually added to the course. The gizzard providing an appreciable note of organ meat while the smoky sweet mirepoix added a welcome complexity and depth of flavor. The bird itself was a bit dry, my companion who had this course earlier tried some of mine and agreed that it was overdone. 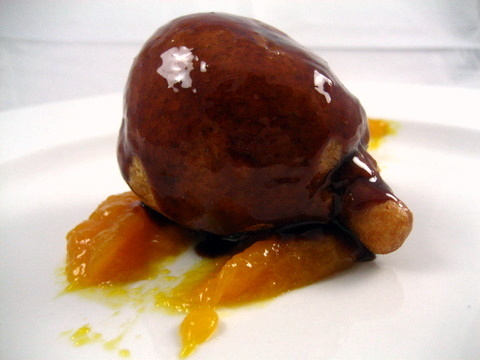 I typically like to end dinner with dessert I wasn't given an opportunity to order dessert, instead we were brought a single baba au Rum which I assume was the dessert course that came with my companions tasting menu. After being open for almost half a year, operations should have been running smoothly by now; however numerous service gaffes kept me from fully enjoying the meal. 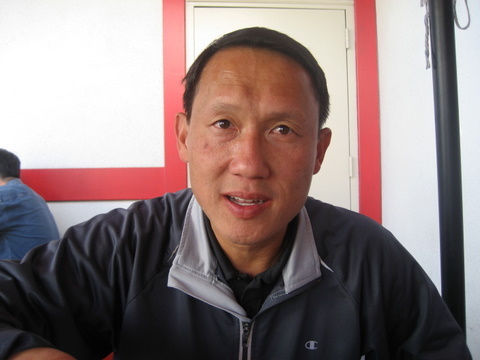 Foremost among the issues was the fact the restaurant wasn't equipped to handle the number of diners. Aside from the long wait between courses in during the middle of dinner, our waitress was so overworked she didn't even have time to describe the courses as they were brought to the table and she forgot to take my dessert order. 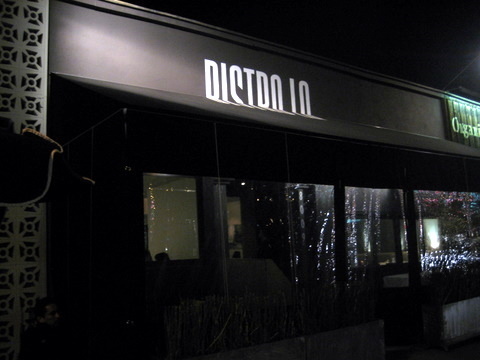 In addition to the above issues, twice the staff made substitutions without informing us first, first with the wines and again when serving my companion Pigeon rather than the hanger steak that was supposed to be part of the tasting. There was nothing wrong with either of the changes, but we would have liked to know in advance so we'd have a choice. After the meal, Chef Quenioux apologized for the spotty service, stating that they were short two chefs and weren't expecting a full house. While I understand problems with the back of the house can be challenging, the restaurant should have better control over the number of diners; either taking fewer reservations or turning away walk-ins rather than accommodating everyone at the expense of the dining experience. While the food was not perfect Chef Quenioux is certainly willing to take risks with the menu even quoting Pierre Gagnaire's maxim when describing the philosophy behind his food. 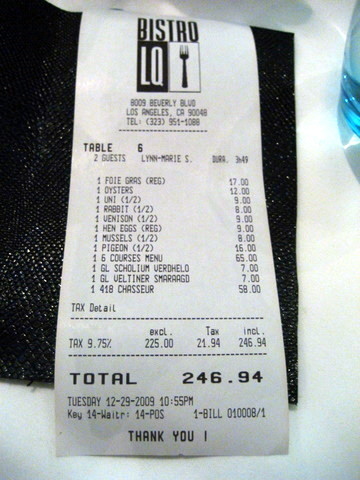 As a result, Bistro LQ offers some of the most distinctive fare available in LA, including intriguing game courses and a superb cheese cart. I'd certainly recommend trying the restaurant though I'd wait until they get their house in order before making that reservation. After watching Adam Richman complete the Orochon Challenge, one of the managers at my company, boasted that it would be a piece of cake. 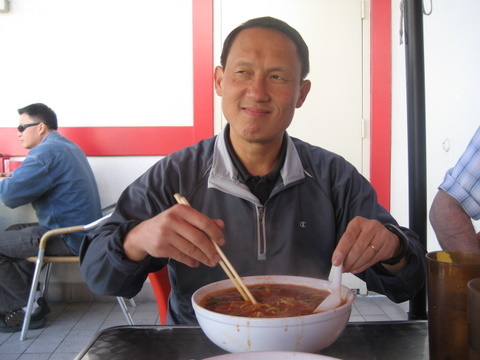 Well I asked him to put his money where his mouth is and that is how we found ourselves driving 40 miles through a horde of Christmas travelers all for a bowl of ramen. Now lord knows why I would even care if this guy could eat a bowl of hot liquid death, but there is something intrinsically entertaining about watching someone inflict pain on themselves out of sheer pride. 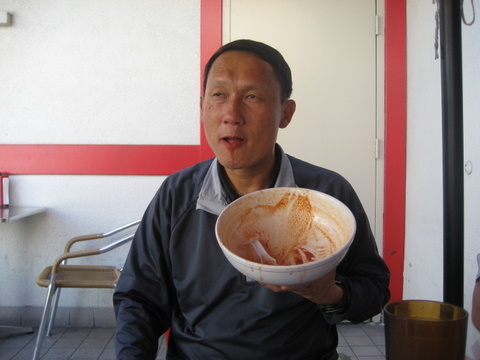 I suspect eating competitions are popular not because people appreciate the athleticism involved, but rather devouring such massive quantities of food appeals to our sense of the grotesque. 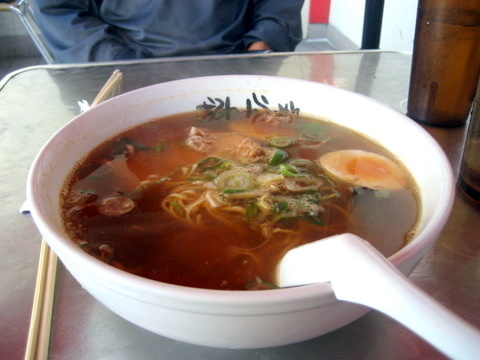 While the Special 2 has a noticeably redder hue than my puny #3 salt ramen, the picture doesn't convey the sheer amount of spice lurking below the surface, I swear there must have been a dozen chopped peppers and a thick layer of chili powder sludge at the bottom. 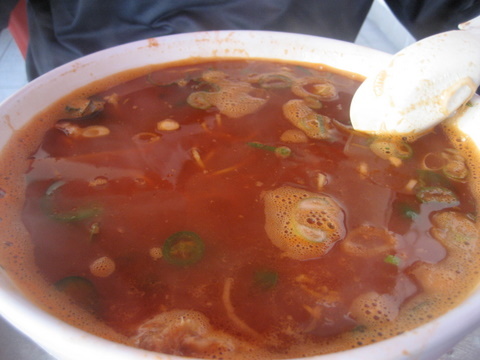 If that secret blend of 13 spices isn't enough to melt your stomach lining, the soup comes out painfully hot to boot. 13:14 - Look at that smug expression, we'll see how long that arrogance lasts once the pain sets in. 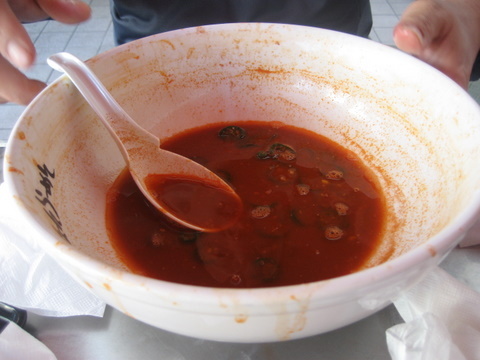 13:28 - Finished with the solid food and about a quarter of the way into the soup, starting to get red and slightly labored breathing but not too bad all things considered. 13:33 - Is this it? 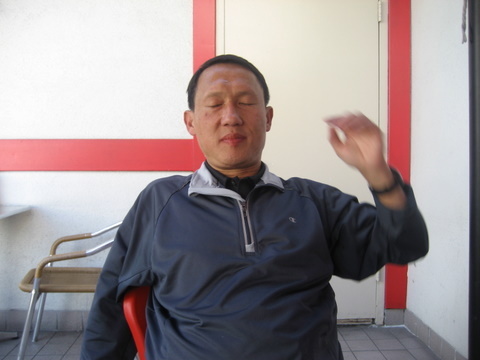 He has waved off the bowl and leaned back in his chair. With over 10 minutes remaining and just a couple bites left, there is still time to recover but does he have the willpower to do it? 13:36 - Yes he does it! I guess there is some truth to all those motivational posters plastered on the walls at work; our leaders do find a way. After almost giving up, my coworker came back and gulped down the last three spoonfuls of soup and peppers. While he won the challenge, he certainly doesn't look the part of a winner. Click on the picture to check out the full sized version in all its glory, note the glassy unfocused look and the slack jaw with soup dribbling down the chin. Afterward my colleague mentioned he almost gave up but when he saw me reveling in his failure it galvanized him into finishing the challenge. It's good to know that I can motivate people through the desire to prove me wrong. Looks like I have finally found my a leadership style that suits me: pure unbridled contempt. Ah LudoBites 3.0 we hardly knew ye. Earlier in the month Chef Ludovic Lefebvre opened the third incarnation of his transitory restaurant LudoBites and here we are 20 days later to celebrate its swan song. Of course this dinner was booked solid long in advance. I was lucky enough to secure a seat thanks to Wesley of Two Hungry Pandas who immediately booked the table as soon as our meal ended on opening night. The atmosphere in the dining room was similar to a large dinner party, with familiar faces across many tables all gathered to enjoy their last taste of Ludo's cooking for the foreseeable future. Though the latest incarnation of LudoBites offers alcohol, two members of our party, Will and Remil, were kind enough to bring a couple bottles. 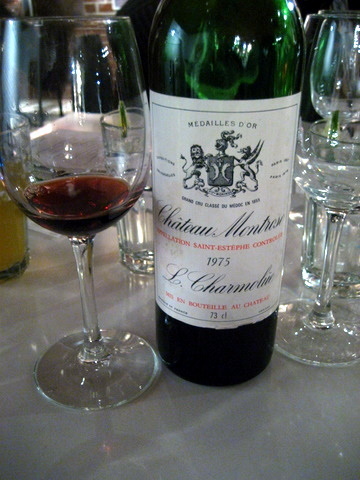 We started with a 1975 Chateau Montrose, the wine opened with a noticeable funk but eventually opened up revealing notes of tobacco and earth with light hints of red fruit on the finish. Next up was a superb 2006 Les Clos Sacrés which smelled powerfully of honeyed apricot and peach and presented a medium body and ripe spiced stone fruit on the palate. We continued onto a very fruit driven 2006 Domaine Serene Yamhill Cuvée that delivered a classic scents of red cherry and strawberry; pleasantly sweet and easy drinking. 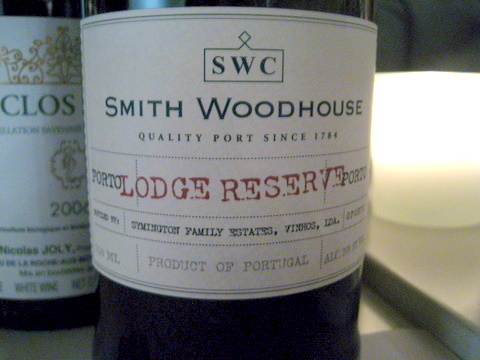 Remil's contribution to our collection was a N.V. Smith Woodhouse Porto, Lodge Reserve from Portugal, that came packed with flavors spiced raisins and sweet cherry syrup. I like to think of the first course as a tuna nigiri crudo, combining the classic elements of sushi: fish, rice, soy, and ginger in a contemporary presentation. 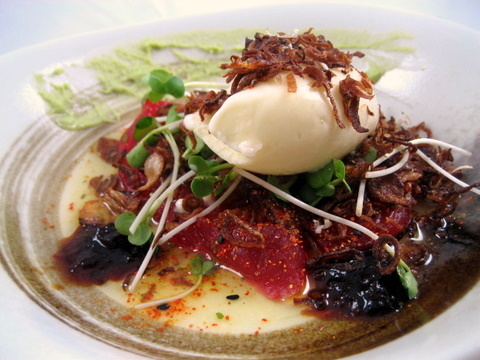 The flavor profile was anything but classic, with an almost meaty smokiness and a refreshing counterpoint from the sprouts, dimensions lacking from a traditional maguro nigiri. One of the most one dimensional courses I can recall in recent memory and that dimension is bitter. Danny pointed out that the cooked endive reminded him of bitter melon and there were quite a few double takes around the table as our party got their first taste of this course. I'm not sure what Ludo had in mind with this course but if it was shock value then mission accomplished. I thought this might be similar to the soup at Guy Savoy but the celery root proved to be remarkably neutral, more like a cream of potato soup. 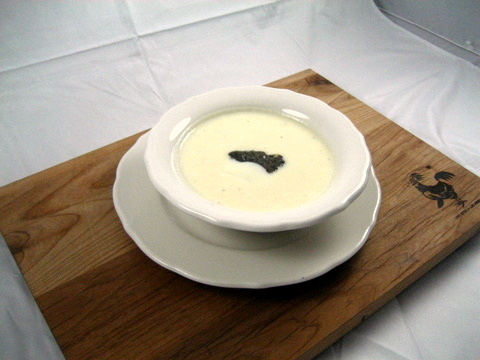 The black truffle was almost undetectable leaving the Parmesan as the dominant flavor component. This course was held over almost in its entirety and with good reason, this was easily one of my favorites during the opening night. The only new addition, black olive added a pronounced earthiness though I preferred the tangy red onions of the earlier version. The table favorite of the evening was Ludo's take on the classic Oeufs en meurette, poached eggs in red wine sauce, the runny egg combined beautifully with the robust sauce. As if the dish wasn't flavorful enough already, we slathered the mixture on slices of thick toast covered in delicious lardo, or cured pork fat. 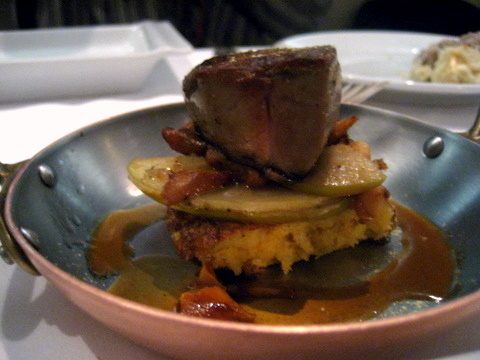 Another holdover with some changes, the foie was served cold giving it luxurious density that certainly felt like a lot more than two ounces. A classic pairing of jammy sweet apricot though with a fragrant musk from the saffron. The lighter celery root previously paired with the dish would have been a better counter for the weightier foie of this presentation. The veal udon generated a great deal of buzz around the table during our previous meal, the savory heft of the veal making for a particularly umami-laden noodle soup. 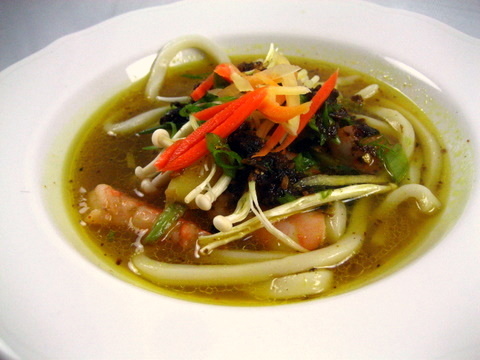 The shrimp is a more conventional pairing, but Ludo demonstrates his creative flair with the addition of Vadouvan butter; the resulting udon was far sweeter with an exotic curry flourish. 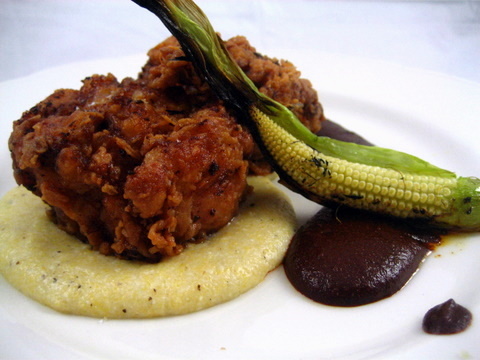 Ah yes fried chicken, long the province of fast food chains has seen new life in the hands of chefs like Ludo. My first taste of "LFC" was a revelation, I never thought fried chicken could be so juicy and flavorful and at the opening, Krissy mentioned the chicken was even better this time around. This was probably my most anticipated dish of the night and it did not disappoint the meaty blocks of chicken were just as tender and delicious as I remember with a hint of spice and rosemary to boot. The mole was a substantial improvement over the previous version with more clearly defined flavor and a distinctive dark chocolate essence. Despite the quality of the accompaniments, the chicken was just too delicious on its own. 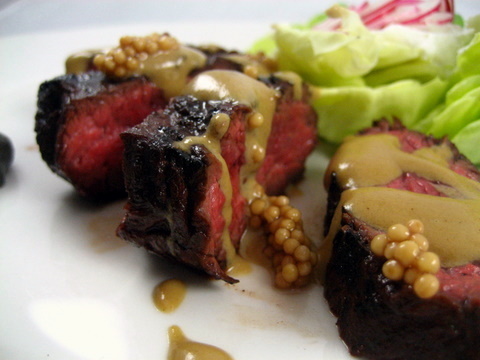 Ludo has demonstrated an exceptional mastery of steak and dressing a beef course. This marks the third steak I have had at LudoBites, each drastically different and though all have been exceptional this may be the best one yet. As always the steak was cooked perfectly but what makes this is the goat cheese. Creamy and smooth it takes on the flavor of the beef while adding an appreciable heft, this inexplicably simple pairing left me in awe. 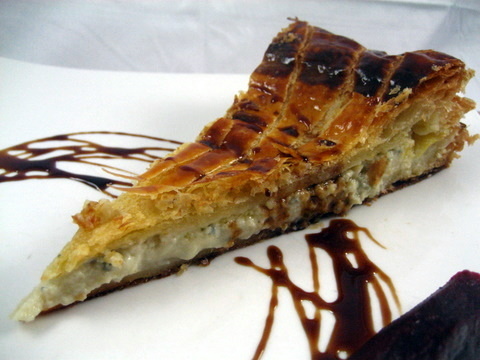 The only course to survive LudoBites 3.0 completely unaltered was the cheese tourte. Perhaps the course that received the most mixed reviews last time, the tourte proved to be quite popular with this crowd. Most members of our party either had multiple pieces or took some home for breakfast, for my part I did both. Traditionally crème brulee comes in a near perfectly shaped cylinder, by comparison, this presentation had a rustic feel with an extra-thick layer of custard and uneven caramelized top. 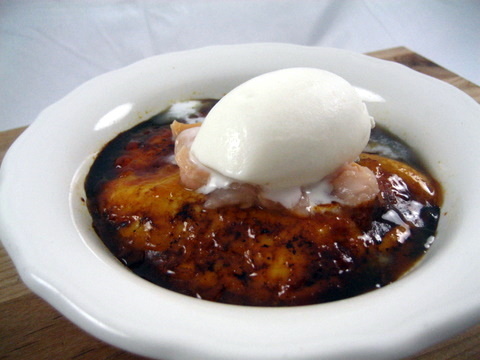 I prefer crème brulee with a thick layer of caramelized sugar on top which adds complexity to the sweet custard though the rose ice cream provided a mild floral aroma that kept things interesting. Though not much to look at this turned out to be an exceptional finish to the meal. 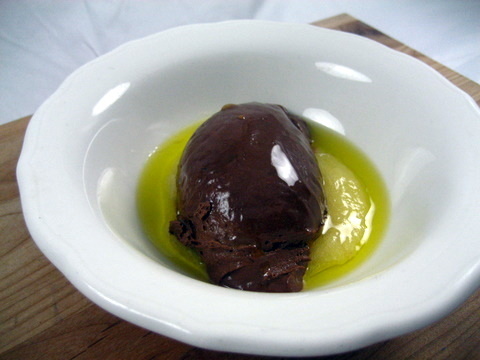 The rich chocolate base was just the starting point for this dessert which featured a bouquet of fragrant olive oil, an earthy savoriness from the soy, and finished with a palpable heat from the jalepeños. With a party of 8 we ended up ordering two of everything with supplements of the stronger courses. 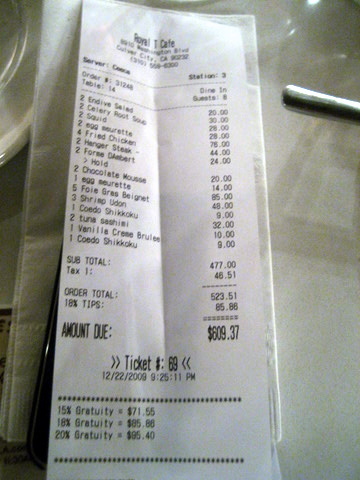 While this helped keep costs down, it typically left people with one bite of each course, hardly enough to get a decent tasting. I felt the menu was a bit less to my taste than at the start of the month; no doubt the result of an Ludo's incessant tinkering. On the plus side, if whats being served one day doesn't agree with you, you can come back a week later and its a safe bet things will have changed. Our party started getting restless around the time dessert came out, with people getting up to visit the kitchen or chat with friends at other tables. Part of the unique charm of the last two LudoBites finale is the camaraderie about the dining room. We lingered for over an hour after our meal chatting with staff, guests, and of course Ludo and Krissy, listening to stories about the kitchen and trying to tease out where Ludo would end up. Despite our efforts we were left in the dark with regards to Ludos future, but one thing I do know is that I'll be there day one wherever Ludo pops up again be it LudoBites 4 or at his permanent home. 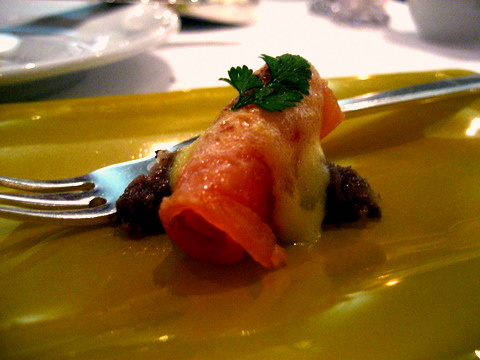 The final stop on the Aria culinary tour was Julian Serrano's eponymous restaurant offering traditional tapas with hints of "molecular" techniques. 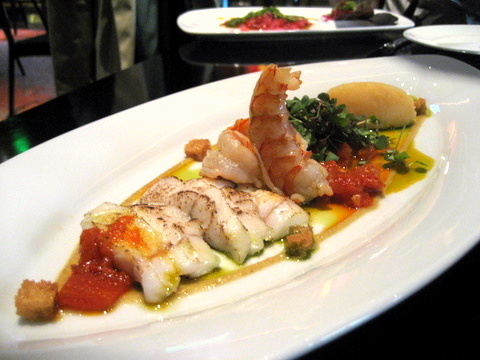 New style tapas aside, the menu still draws comparison to Jose Andres' Bazaar for the similarity of multiple dishes. For our part we tried to order as many of the duplicates as possible to better compare between the two. 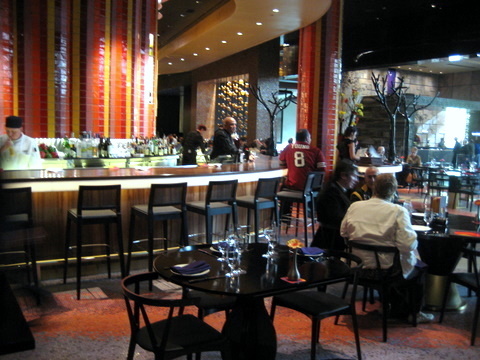 The interior is awash in bright colors with yellow, red, and orange tiles decorating the wall behind the bar. Playful elements abound like the black plastic trees and bubbles strung up on along the exterior walls giving the dining room a lively relaxed feel. A fairly reserved drink, with a bit of the herbs from the gin and bitterness from the Lillet coming to the fore. 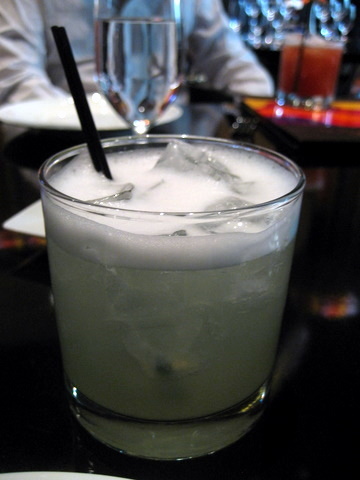 I expected more apparent apple notes but even without them the drink was quite refreshing. 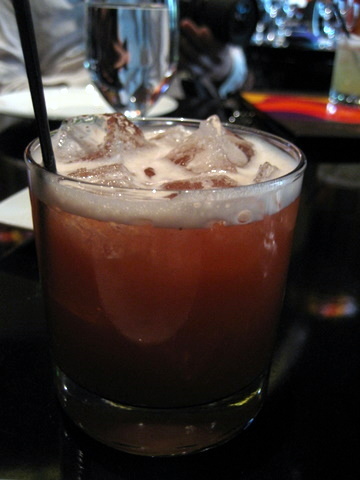 My companion selected the Dulce y Picante which blends sweet and spicy elements into a multistage affair with the two flavors alternating dominance. 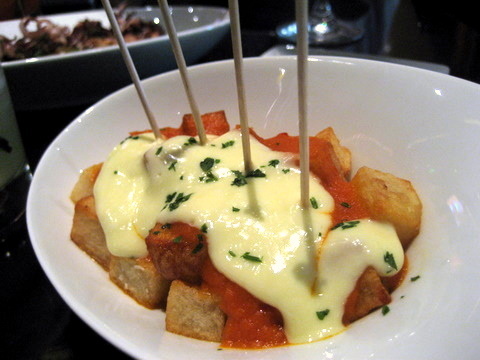 A wonderful presentation of patatas bravas, the savor of the fried potato is complimented by the vibrant tomato and piquant alioli. This has been a consistent standout at The Bazaar so I was eager to see how Serrano's would compare. Just as delicious in terms of flavor, the only difference was the more even texture of the filling. I wasn't expecting much from this dish but it turned out to be the best of the lot. 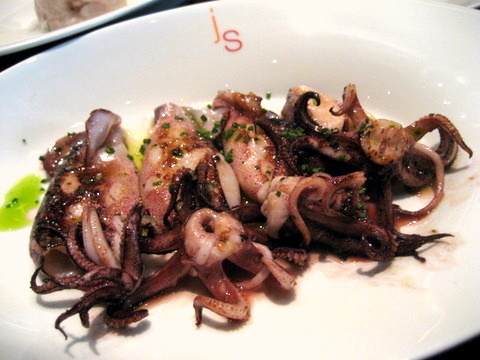 The squid looked like the same spear squid we had at Bar Masa but two nights ago. 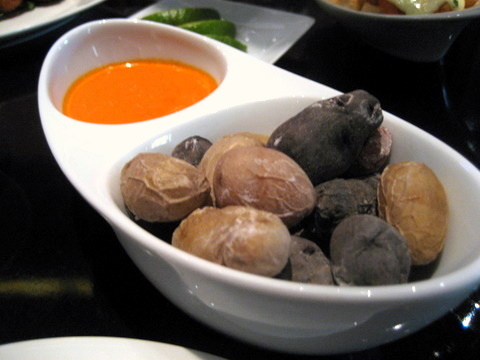 The morsel was imbued with an even salinity tinged with perhaps the slightest hint of squid ink. The ethereal fruit notes of the e.v.o.o. 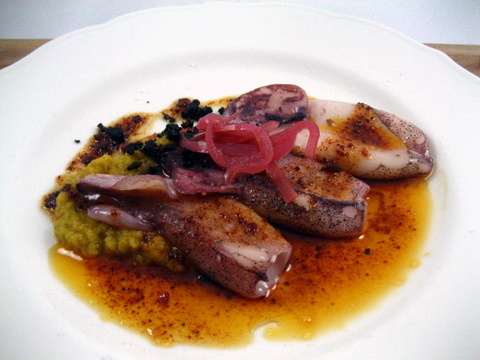 complimented the squid beautifully while preserving the natural flavor. An interesting contrast from the brava potatoes above, here the salty potatoes could be enjoyed on their own, but it was really the complexity of the tangy smoky sauce that stood out. 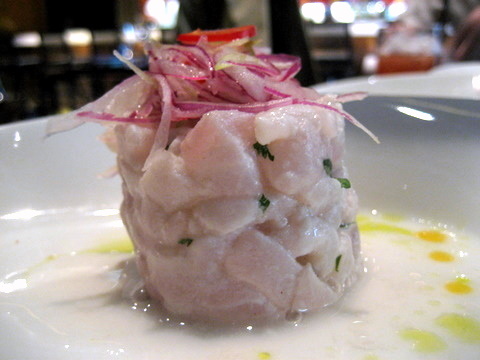 A textbook ceviche, the fish had a dense but pliant meatiness to it with the citrus providing the bulk of the flavor. 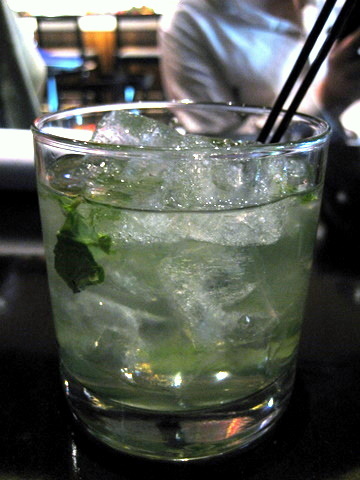 A shade of fresh herbs and heat compliment the bracing acidity of the lime juice. 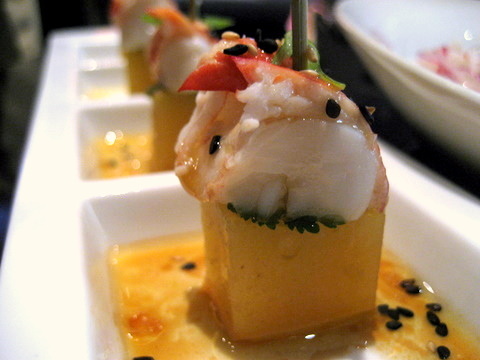 The first of the new style tapas we ordered, the dense meaty lobster was a bit heavy for me and the heavy jellied body of the pineapple only made things worse. Ironically I would have preferred a piece of fresh pineapple with a bit more acidity rather than the cloying sweetness of the molecular variety. Contrasting my earlier Manzana Deliziosa, this cocktail was flush with the flavor of sweet Bartlett Pear to the exclusion of almost all other flavor. Quite sweet this would have made a great pairing for a fruit dessert. 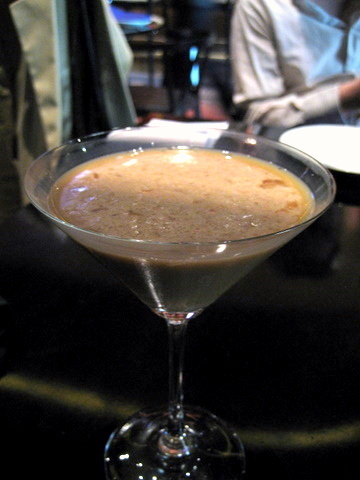 An interesting drink, replete with the aroma and flavor of fresh coffee plus some alcoholic heat on the finish. 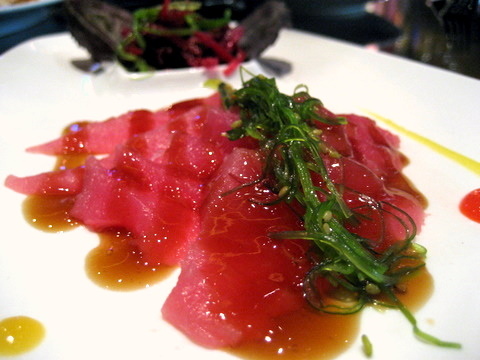 The centerpiece of the dish was the thinly sliced ahi tuna covered in a thickened ponzu sauce. The reduced ponzu sauce was a bit overpowering requiring the addition of the seaweed to temper it, bringing the dish back into balance. 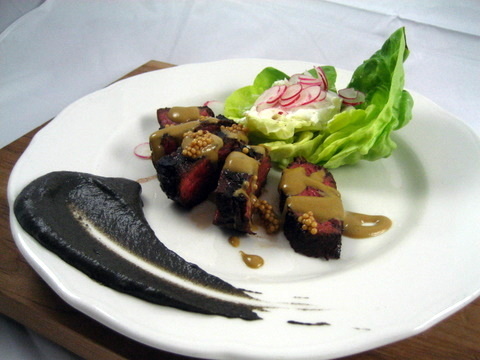 Our last savory was another pick from the New Style group, the individual elements arrived neatly laid out on the plate. The fish and shrimp alone were both solid but certainly nothing special. The potatoes and sofrito detracted a bit from the simple flavors of the seafood, but bound the dish together in a way that more than made up for the loss. I wasn't too keen on the dish but it looked too interesting to pass up. 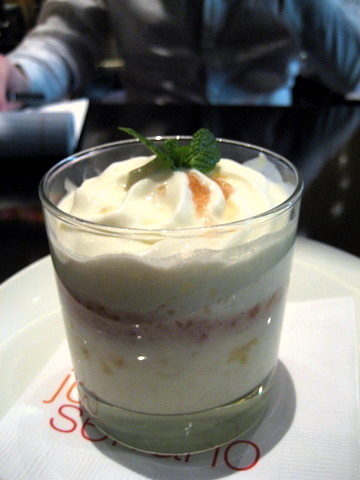 Perhaps somewhat unsurprisingly, the dish had a mouth feel reminiscent of rice pudding and a taste similar to horchata. 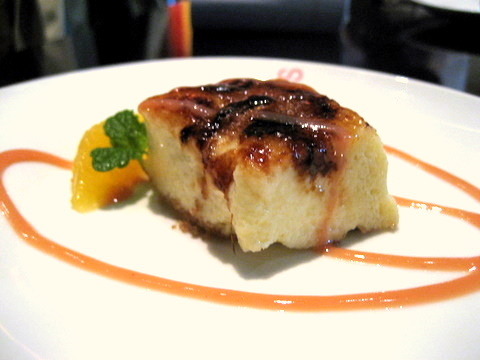 The other dessert was a bread soaked in cream, think tres leches cake but less sweet, the top was browned giving it a slight bitterness which was complimented by the sweet caramel custard and bright fresh citrus. 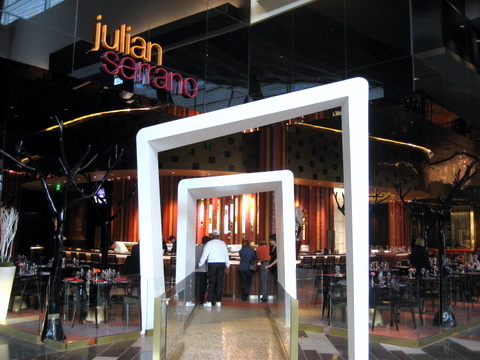 Julian Serrano is best known for his Michelin 2 star Picasso, probably the first true fine dining restaurant in Las Vegas. 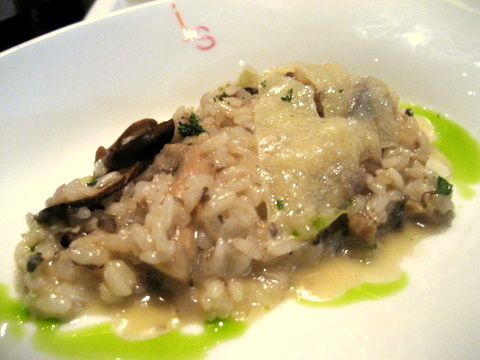 I entered Julian Serrano's newest venture with some mixed feelings from my underwhelming experience at Picasso. Though the restaurant has garnered two Michelin stars, the food simply paled into insignificance when compared to the sublime experience at fellow two star, Guy Savoy. This left me wondering how much of Serrano's reputation was built by when Picasso was the only game in town for people seeking a high-end restaurant. Despite my worries, the food turned out to be quite strong, perhaps the most straightforwardly enjoyable of the three Aria restaurants. 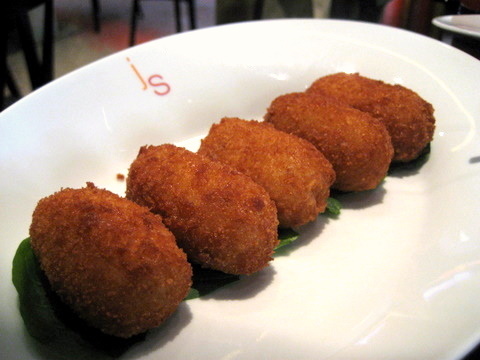 I could easily see a couple of weary friends, coming off a 12 hour gambling binge stumble into the restaurant to munch on chicken croquettas while lamenting their lost fortunes.